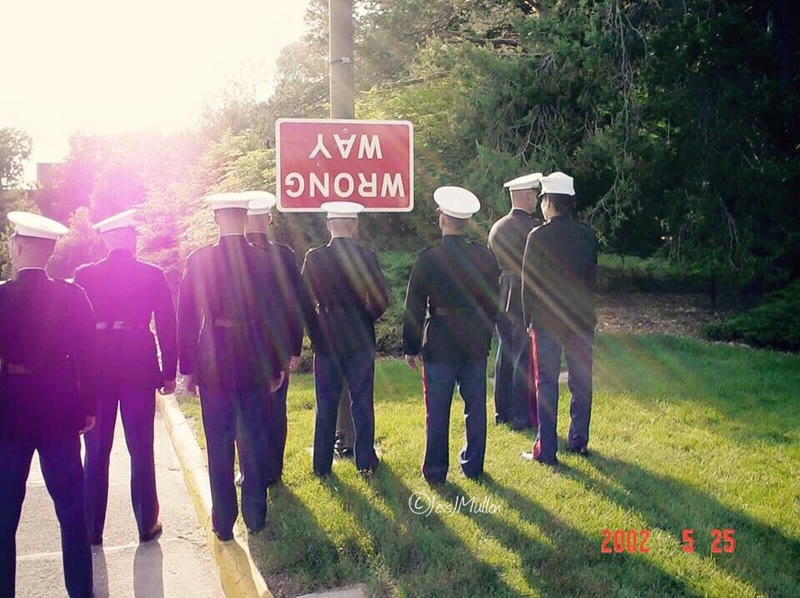 Most of my friends are Marines, and some are married to Marines. Many are still active duty, some are veterans and some of my best friends on the planet are stay at home moms (mad respect) who fall into one or more of the categories listed above. 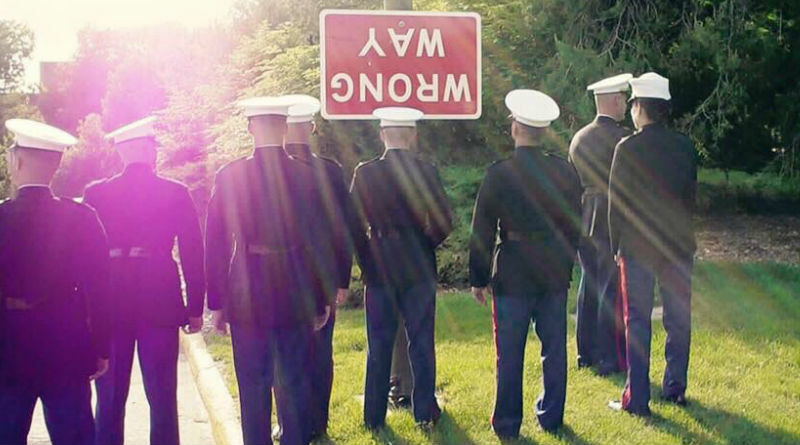 This afternoon while scrolling through my newsfeed enjoying all the motivating, preposterous and somber posts about the 240th birthday of the Marine Corps, this gem caught my attention. It appears to be a bunch of lost lieutenants- funnier than hell if you’ve ever heard the joke about a lieutenant with a map. Womp. Womp. I smiled and sent the friend who posted it a note about adding a watermark. She responded with a hearty “Happy Birthday, Marine.” Jess is the Marine on the far right in the photo. Thirteen years later (according to retro time-stamp), she still wears that uniform. She told me the story behind the photo; walking to a friend’s wedding, saw the sign, jumped at the chance for a funny shot. Her husband is also in the photo and he too still wears the eagle, globe and anchor. He’s still on active duty. She’s now a reservist and they’re raising four fantastic daughters. They were captains when I met them; instructors at TTECG where I was assigned to teach media skills once upon a time. He scared the hell out of me and she never stood still long enough for me to get to know her. I’ve since had the chance to get to know her and I’m in awe. She shared a few more photos while we exchanged messages today. 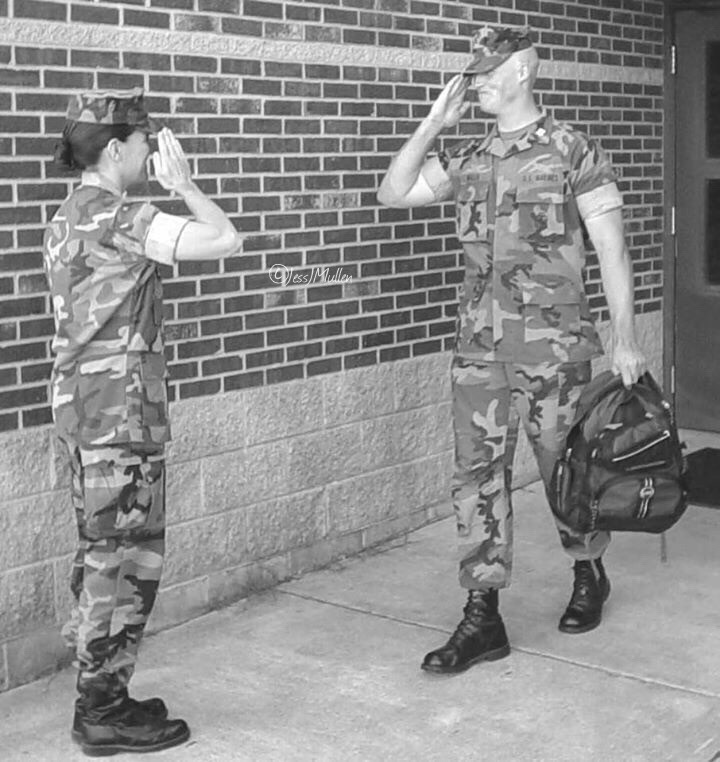 In this one, she saluted him. He was frocked to captain and, for a short time, outranked her. “Look at the look on his face,” she wrote, drawing my attention to his giant smirk. A closer look reveals she was beaming too. The level of busy she exuded when we first met makes sense these days. They homeschool, their daughters wrestle, play hockey and golf, attend science camp and knit… (seriously, I traveled to a wrestling conference early this year and Nora knitted between her matches). Shannen won her matches and gave her medal to my 6-yr-old nephew after realizing how excited he was about her winning. He was smitten. 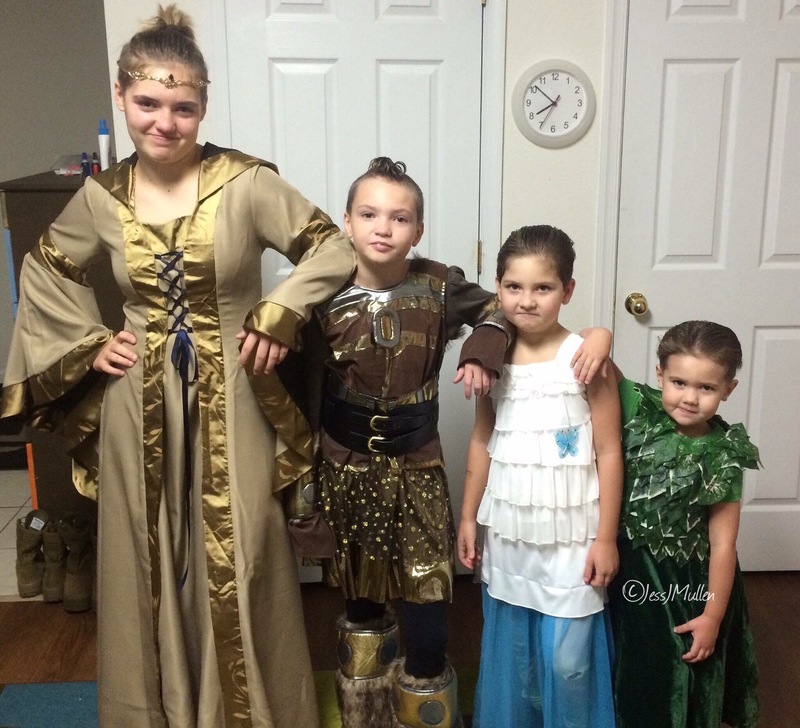 They dress them up for the Renissance Fair. 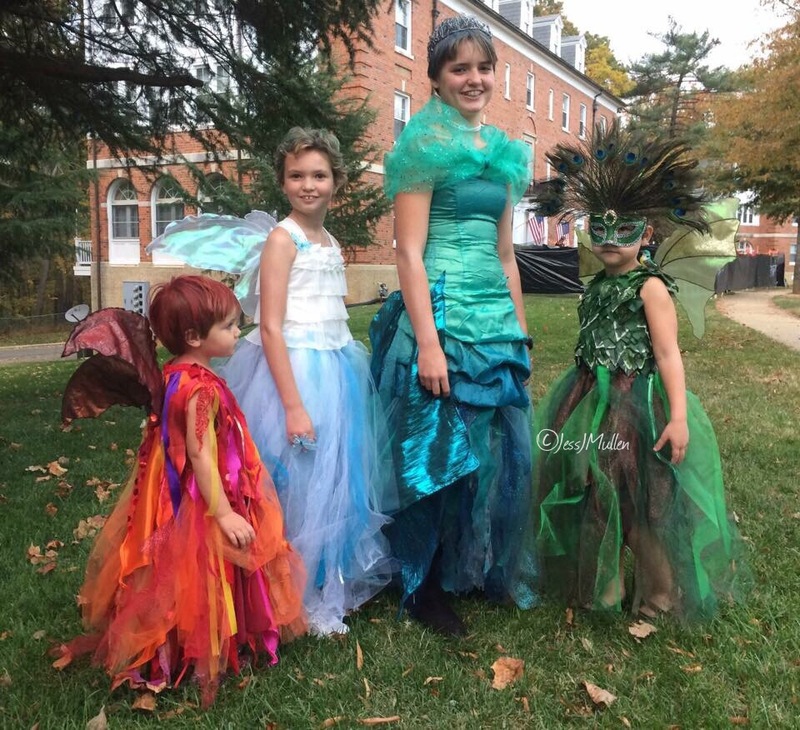 Last year they were Elemental Fairies for Halloween: Fire, Air, Water and Earth. Getting to know Jess (and Sean) and watching their girls grow through social media and in real life when schedules permit, reminds me of the core values the Marine Corps holds in such high esteem. They embody them *and* teach them to their daughters. We chatted a bit longer and promised to plan a visit when they moved down to North Carolina after he takes command of a battalion next year. We exhanged another round of motivated birthday pleasantries and she said goodnight. It was mid afternoon here but Jess, aka LtCol Mullen, is finishing up a six month deployment to Kuwait and Sean, aka Major Mullen, is manning the fort at home. We read stories about Marine wives and Marines who are moms and about deployed Marines but Jess is the only friend I have who is all of those things and gracefully rotates hats as needed. And so. Happy birthday to all my Marine brothers and sisters but especially to the humble, brilliant, strong, beautiful and wickedly funny Mom/Ma’am serving so far from her fantastic family today. Great post Jenn. My wife (also a Marine) and I will exchange a lot of memories with old friends at the Birthday Ball tonight. I will tip one for you. Happy Birthday. !